To Cite: Razi Jalali M, Jalali M T, Mapar Z. Evaluation of Plasma Cytokine Levels in Mesobuthus Eupeus (Scorpionida: Buthidae) Scorpion Envenomation in Rats Treated With Polyvalent Antivenom, Jundishapur J Health Sci. 2015 ; 7(1):e27159. doi: 10.5812/jjhs.27159. Background: Previous studies have demonstrated that scorpion venom increases blood levels of some cytokines, including Interleukin-1 (IL-1), Interleukin-6 (IL-6), and Tumor Necrosis Factor-alpha (TNF-α) in experimental model of scorpion envenomation in laboratory animals. Objectives: This study aimed to measure circulating cytokines levels in rats after envenomation with Mesobuthus Eupeus scorpion and to compare the findings in rats treated with polyvalent antivenom to evaluate the role of routine treatment in scorpion envenomation. Materials and Methods: For the present research, the venom of Mesobuthus eupeus scorpion was extracted by electric shock and then intraperitoneally injected (1.5 mg/kg) into 2 groups (V: venom group and AV: antivenom group) of 36 Wistar rats each weighing 200 ± 10 g. Additional 36 rats were considered as control group (group C) and were intraperitoneally (ip) injected with 50 μL saline solution. Group AV were injected ip, with polyvalent antivenom 2.5 ml/kg, 30 minutes after envenomation. Heparinized blood samples were collected by heart puncture at different time periods (1, 3, 6, 12, 24, 48, and 72 hours) after venom injection for determination of the levels of plasma cytokines, including IL-1α, IL-6, and TNF-α by Ray Biotech specific ELISA kits for rats. Results: IL-1a, IL-6, and TNF-α levels were significantly increased in 3 hours after envenomation in both groups (V and AV), but the intensity of increase in AV group was less than the other group, i.e. moderate elevation of cytokines occurred after treatment with polyvalent antivenom. At next time points, gradually decreasing amounts of cytokines were seen. 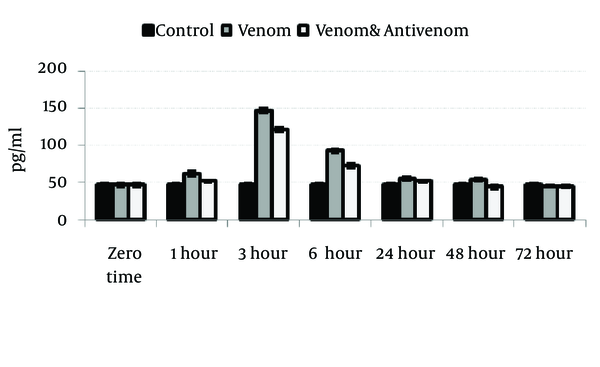 Conclusions: Our data suggest that using polyvalent antivenom in short time after envenomation could reduce the inflammatory responses related to the systemic changes during the elevation of cytokines in scorpion envenomation. Scorpion envenomation is a common medical problem in many tropical and subtropical countries, and an important cause of morbidity and mortality, especially in children. Mesobuthus eupeus is one of the important scorpion species in Iran. The injection of toxins from several scorpion species in animal models induces several disturbances in different organs and systems. Envenomation with scorpion venom in experimental animals produce systemic effects with signs and symptoms similar to those observed in human envenomation such as fever, salivation, lachrymation, increased gastrointestinal tract mobility, cardiac and respiratory arrhythmias, arterial hypertension followed by hypotension, cardiac failure, pulmonary edema, and shock. These features have been traditionally explained by the effects of neurotransmitters released by the scorpion venom, but the release of mediators of the systemic inflammatory response syndrome may also play an important role (1, 2). Interleukin-1 (IL-1) is one of the first cytokines ever described. Its initial discovery was described as a factor that could induce fever, control lymphocytes, increase the number of bone marrow cells, and cause degeneration of bone joints. It was around 1984-1985 when scientists confirmed that IL-1 was actually composed of two distinct proteins, now called IL-1α and IL-1β. These belong to a family of cytokines known as the interleukin-1 superfamily. Interleukin-6 (IL-6) is a multi-functional cytokine that regulates immune responses, acute phase reactions, and hematopoiesis. It may play a central role in host defense mechanisms. IL-6 is usually not produced constitutively by normal cells, but its expression is readily induced by a variety of cytokines, lipopolysaccharide, or viral infections. IL-6 is a pleiotropic cytokine produced by a variety of cells. It acts on a wide range of tissues, exerting growth-induction and differentiation, respectively, depending on the nature of the target cells. Tumor necrosis factor alpha (TNF-α) is a potent mediator of immune and inflammatory responses. TNF is produced by many activated cell types, including monocytes, macrophages, astrocytes, granulocytes, T and B lymphocytes, NK cells, keratinocytes, fibroblasts, and certain tumor cells. TNF exerts many regulatory influences on the activation, growth, and differentiation of leukocytes and other cells. In vivo, TNF serves as a primary mediator in protective immune responses against microbial and viral pathogens. However, TNF has also been implicated as a central mediator in several pathologic responses, including septic shock, cachexia, and autoimmune diseases. 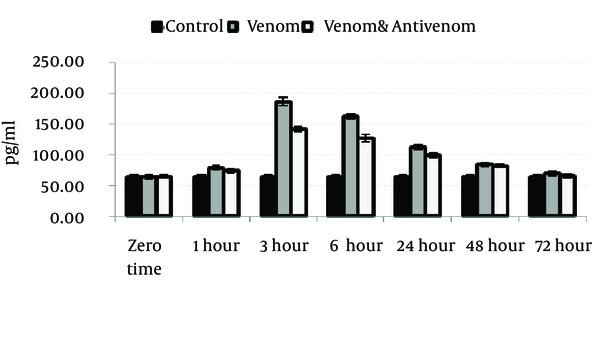 This study aimed to measure circulating cytokines levels in rats after envenomation with M. eupeus scorpion and to compare the findings in rats treated with polyvalent antivenom to evaluate the role of routine treatment in scorpion envenomation. Freeze dried M. eupeus scorpion venom was purchased from Razi Vaccine and Serum Research Institute, Ahvaz, Iran. It was collected by electrically stimulating the telson of scorpion. The venom was dissolved in 0.9% sodium chloride solution to a proper concentration. The polyvalent antivenom was produced by Razi Vaccine and Serum Research Institute. It comprises a purified solution with F (ab) 2 fractions of equine immunoglobulin, specific for venoms of 6 species of medically important scorpion species in Iran, including Odontobuthus doriae, Mesobuthus eupeus, Androctonus crassicauda, Buthotus (Hottentota) saulcyi, Buthotus sach and Hemiscorpius lepturus. Polyvalent scorpion antivenom was prepared in horse hyperimmunized with crude venom of M. eupeus by the Razi Institute for Serums and Vaccines, Iran, and used according to the manufacturer instructions. A total of 108 healthy (3-4 month age) male Wistar rats weighing 200 ± 10 grams were purchased from the laboratory animal house of Ahvaz Jundishapur University of Medical Sciences, IR Iran, and were maintained at controlled temperature (23-25°C) and humidity (E40%) with a 12:12 lightness/darkness cycle. They received a standard pellet food and tap water free ad libitum. For the present research, M. eupeus scorpion venom was intraperitoneally injected (1.5 mg/kg) into 2 groups (V: venom group and AV: antivenom group) of 36 each Wistar rats weighing 200 ± 10 grams. Additional 36 rats were considered as control group (group C) and were intraperitoneally (ip) injected with 50 μL saline solution. Group AV were injected ip with polyvalent antivenom 2.5 ml/kg, 30 minutes after envenomation. 1. Prepare all reagents, samples and standards as instructed. 2. Add 100 μL standard or sample to each well. Incubate 2.5 hours at room temperature or overnight at 4°C. 3. Add 100 μL prepared biotin antibody to each well. Incubate 1 hour at room temperature. 4. Add 100 μL prepared streptavidin solution. Incubate 45 minutes at room temperature. 5. Add 100 μL TMB one-step substrate reagent to each well. Incubate 30 minutes at room temperature. 6. Add 50 μL stop solution to each well. 7. Read at 450 nm immediately. Calculate the mean absorbance for each set of duplicate standards, controls, and samples, and then subtract the average zero standard optical density. Plot the standard curve on log-log graph paper or using SigmaPlot software, with standard concentration on the x-axis and absorbance on the y-axis. Draw the best-fit straight line through the standard points. Statistical analysis was performed using Analysis of Variance (ANOVA) and Student t test by SPSS Software version 16 (SPSS, Inc., Chicago IL, USA) to compare the data from the controls with those from the envenomed rats with or without treatment. The cytokines level measurements were expressed as the mean ± standard error of mean (SEM). The statistical significance of differences within groups was analyzed by using Student t test. Variations among different groups were analyzed by using the Tukey-Kramer rank correlation coefficient. Values of P < 0.05 were considered significant. Venom injection caused significant (P < 0.05) increase in IL-1α, IL-6, and TNF-α level at 3 hours after envenomation. There was also an increase of these cytokines in polyvalent antivenom treated group compare to the control, but the elevation of cytokines was less than venom group. Gradually, the cytokines level will decrease after 3 hours and reach the normal range at the end stage of the study, 72 hours after envenomation (Figures 1, 2 and 3). Severe scorpion envenoming produces a systemic inflammatory response syndrome that may cause shock, pancreatitis, cardiac dysfunction, and pulmonary distress (5-8). In the present study, after scorpion envenomation, significant elevation in cytokines levels (IL-1a, IL-6 and TNF-a) was seen. Overall, the levels of IL-1a, IL-6 and TNF-α were increased in envenomed groups (V and AV) compared to controls. Further studies are needed to provide a more clear view of the mechanism of action of M. eupeus venom. Furthermore, severe cases of envenomation also showed significantly higher levels of cytokines compared to the mild envenomation. The activation and release of cytokines may play an important role in the pathophysiology of intoxication following scorpion sting and may account for SIRS manifestations and organ failure following envenomation, besides the direct effect of the venom and neurotransmitters released by the venom in different organs (3, 9, 10). The levels of these cytokines tended to increase the beginning of envenomation. Significantly increased plasma levels were observed at 3, 6, and 12 hours after envenomation. Several studies have emphasized the relevance of proinflammatory mediators, including leukotrienes, prostaglandins, platelet activating factor, kinins, and Nitric Oxide in the pathophysiological manifestations of human and experimental scorpion envenomation (4, 11-13). Tityus serrulatus scorpions are found to nonsignificantly increase levels of IL-6, IFN-g, GM-CSF and IL-10 in patients with mild to moderate envenomation and significantly elevate IL-1a levels in all cases. Fukuhara et al. (14) showed that the increased levels of IL-1b, IL-6, IL-8, TNF-α, and IL-10 in patients envenomed by Tityus serrulatus were positively correlated with the the severity of envenomation. These results suggest that the physiophatological manifestation of Tityus serrulatus envenomation may be mediated, at least in part, by the direct action of proinflammatory cytokines (TNFα, IL-1b, IL-6 and IL-8) or indirectly by mediators released by proinflammatory cytokines. On the other hand, IL-10 may down-regulate the release of proinflammatory mediators, consequently reducing the intensity of the pathological manifestation observed, especially in moderately and severely envenomed patients. As a corollary, these results indicate that the evaluation of serum levels of these cytokines, particularly in moderate and severe cases, may be of prognostic value, and the early treatment of these patients with drugs that inhibit cytokine production, like glucocorticoids, may have a beneficial effect. Although we measured IL-6 levels, current consensus favors TNF and IL-l rather than IL-6 as the key messengers that initiate the inflammatory response. Both cytokines mediate inflammatory manifestations by themselves, but more importantly they induce the secretion of proinflammatory cytokines and products, which amplify and sustain the response. Serum IL-6 levels increase rapidly in acute inflammatory and trauma states, whereas such an increase in serum IL-l and TNF levels is hardly evidenced (15). Measurement of serum IL-6 levels, however, frequently reflects the generation of IL-l and TNF, which are the strongest introducers of IL-6 (15, 16). Our results suggest that changes in IL-6 levels may be indicative of the pathophysiology of scorpion envenomation, and may open the way to the adaptation of novel therapeutic approaches to reduce the damage of scorpion envenomation. Patients with severe scorpion envenoming can also develop a SIRS-like response that may be involved in the pathogenesis of shock, cardiac dysfunction, and pulmonary edema (17). The clinical findings in these patients are very similar to those seen in patients with sepsis, in which the levels of proinflammatory mediators (TNF, IL-1, IL-6, PAF and eicosanoids) are altered. Different proinflammatory cytokines appear to be directly involved in the responses occurring after infection (e.g. sepsis) and may prove to be important in tissue injury promoted by severe scorpion sting. In contrast, IL-10 plays a major role by modulating the activation of cells from monocyte/macrophage lineage and may be involved in regulation of monokine synthesis (18, 19) In addition, the measurement of cytokine serum levels may have prognostic significance in scorpion sting. Thus, patients with increased serum levels of IL-1a, IL-6, IFN-g, and GM-CSF may have a worse prognostic. We postulate that scorpion venom can induce a systemic inflammatory response-like syndrome, which is dependent on the dose of venom delivered to the host by the sting and also on the time elapsed between the bite and the onset of symptoms or treatment. It is possible that the patients with mild to moderate forms of envenoming could not fully develop SIRS due to the lower amount of inoculated venom. The efficacy of antivenom to neutralize the circulating venom could also help the organism to balance its response against the injury. The elevated levels of cytokines would be only detectable when the scorpion-induced injury elicited a major host response as demonstrated, for instance, by a major elevation of serum levels of creatine kinase. This was observed in the patient with severe envenomation, but it is difficult to make a strong argument based in one patient. Another studies showed that T. discrepans envenomation induces cytokines, more so at higher venom concentrations and with prolonged envenoming (20, 21). In the light of our findings, the pathology of scorpionism is due to a direct effect of toxins as well as secondary to the consequent abnormal neurotransmitter release, all worsened by inflammatory factors promoted by any of these mechanisms. Abdel-Haleem et al. (22) showed that IL-6, sIL-6R, TNF-α, chemokine, and RANTES are involved in the pathogenesis of scorpion envenomation and correlated with its severity. Pioneering work by Lomonte et al. (23) proved an increase in IL6 after snake envenomation. Barraviera (24) found increased levels of IL6 and IL8, but not of TNF-a and IL1-b in victims bitten by venomous snakes. Later, Barbouche et al. (25) showed an increase in IL6 and IL1-b levels in scorpion envenoming. Abdoon and Fatani (26) reported that the significantly high serum levels of IL8, TNFα (P < 0.001), and nitric oxide (P < 0.0001) observed in their study support the evidence for the role of these potent vasodilators in the terminal hypotension that is usually observed in humans and animals after envenomation. Adi-Bessalem et al. (27) in the study of the pathophysiological effects of Androctonus australis hector scorpion venom, showed that pathophysiological manifestations of AaHIT envenomation may be mediated sequentially or simultaneously by cytokines and the complement system, which in turn activate leukocyte to produce tissue damage. Jalali et al. (9) in the study of serum TNF-α levels reflect the clinical severity of envenomation following a Hemiscorpius lepturus sting suggest that, unlike M. eupeus, the toxic manifestations observed following being stung by H. lepturus are associated with increased serum TNF-α levels and correlate positively with the clinical severity of the symptoms. Furthermore, serotherapy is only effective when administered to mild cases of H. lepturus scorpion envenomation. Similar results were found by Meki and Mohey El-Dean (13), who demonstrated IL1-b, IL6, Nitric Oxide and a1-antitrypsin values were higher in severe than in mild cases of scorpionism, suggesting the involvement of proinflammatory cytokines and the, so-called, acute phase proteins in cases with bad prognosis (28). Increasing evidence suggests a causal relationship between overproduction of certain cytokines such as IL6 and both morbidity and mortality associated with critically-ill patients (13, 29).We found a positive correlation between increased IL6 level and high levels of amylase in patients with moderate severe envenoming. IL6 is the principal mediator of acute phase protein response and is an excellent marker of severity of pancreatitis with peak values (3 to 6 times baseline). IL6 concentration correlates with pancreatitis severity and predicts its evolution (30, 31) On the other hand, basic and clinical advances have provided insights into the molecular events that link inflammation with blood coagulation and thrombosis. TNF-α and IL1 can elicit tissue factor production intravascularly, and whenever the tissue factor contacts the blood coagulation is initiated rapidly. IL6 also stimulates platelet formation with more sensitivity to thrombin activation and with increased procoagulant activity (32), which perhaps enhances the effect of anti-coagulant scorpion toxins. In conclusion, we showed that the elevation of plasma IL-1a, IL-6, and TNF-α in rats envenomed by M. eupeus scorpion venom were correlated with the time after envenomation. 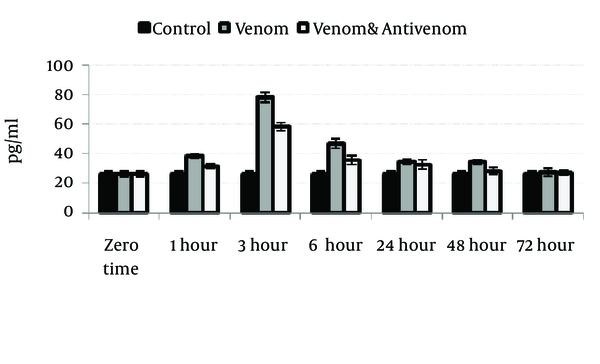 These results suggest that the use of polyvalent antivenom at the short time after envenomation can reduce the elevation of these cytokines after envenomation. As a corollary, these results indicate that the evaluation of serum levels of these cytokines, may be of prognostic value, and the early treatment of these patients with antivenom may have a beneficial effect.